As with the other clubs in this section – Aberdeen AAC, Victoria Park AAC, Hamilton Harriers, etc – this is an account of the beginnings of a club that has achieved a great deal, produced some very good athletes and served the sport well. It is not a history which is too big a subject for a website and in any case it’s not our place to do that. 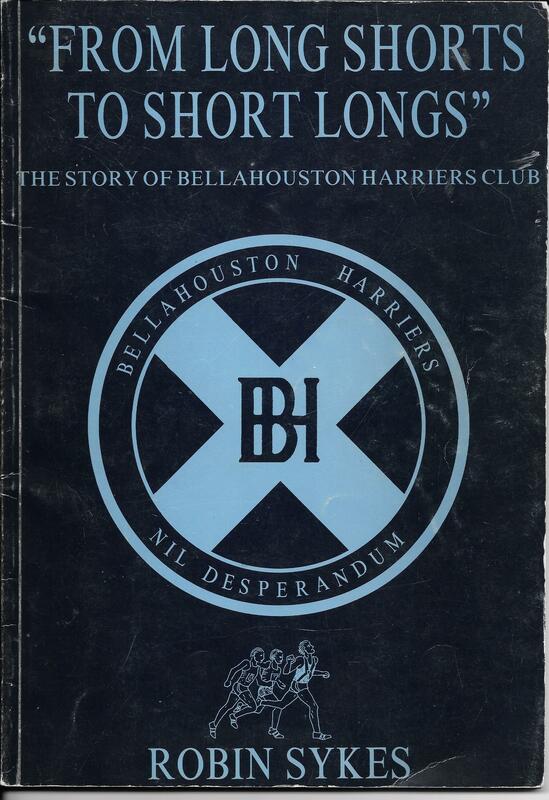 Bellahouston Harriers club centenary history, “From Long Shorts to Short Longs”, written by Robin Sykes was published in 1992 and it was one of the main sources of information for this profile. Robin tells us that “The club was founded in and around the Govan area of south-west Glasgow and credit for the actual founding goes to John R McDiarmid who was, at the time, Registrar for the neighbouring district of Kinning Park. What is not so clear is the origin of the name. The above named Govan and Kinning Park were districts joined to both Ibrox and Bellahouston. The first training grounds were in those 2 districts before the club moved to the Ibrox area. Since the Bellahouston district, up to this time, seems to have had ‘no part of the action’ it could be that it was finally rewarded with the name. Certainly Govan Harriers, Kinning Park Harriers or Ibrox Harriers just couldn’t compare with BELLAHOUSTON Harriers! Since 1892 was the club’s first year, we can start with winter 1892/93. The first cross-country race of any consequence was always the Clydesdale Harriers Seven Miles Cross-Country Individual Handicap and Team Race on the first Saturday in November but the new club did not take part, instead the ‘Glasgow Herald reported that “the five mile handicap of Bellahouston Harriers which fell through some weeks ago owing to the trail being indistinctly marked was brought to a successful issue on Saturday afternoon. The trail layers were Messrs J Allan and W McGuigan, and leaving Ibrox Station at 3:30 they ran out along the Paisley Road, over Bellahouston Estate, skirting Blackwood, on to Bellahouston Home Farm and home by Birnie’s estate and Dumbreck. The competitors were then put in line and set off to a good start. The pace throughout was very hot and the leaders passing and repassing each other time and again. The order in which they passed the judges was:- 1st J Anderson; 2d J McDiarmid; 3d JB Thomson; 4th J Gray; 5th MF Grindlay.” The race referred to was to have been run on 15th October and the occasion was reported in the ‘Glasgow Herald’ which pointed out that the race did start at the Two Mile House on Paisley Road but the runners went off the trail and so the event had been declared ‘null’. On the first of the intervening weeks, Saturday 22nd October, there was a run from the Two Mile House. The Hares were JB Thomson and J McDiarmid and they set off at 2:55. They laid the trail along the Paisley Road to the Halfway House, then round by the fields to Bellahouston Station, and home by the high road. The slow pack was sent off five minutes later under the guidance of Mr Mal Campbell with Mr J Caldwell as whip. They were followed five minutes later by a fast pack led by Mr E Biggar with Mr W McGuigan as ‘whipper-in’. About a mile from home, the packs were got together and a race for home was organised. First three were Biggar, Grindlay and McGuigan. The running time for the fasts was about 45 minutes. The report mentions the hares setting off with ‘the bags’… These runs were usually marked by the hares who carried a crescent shaped bag filled with shredded or torn paper tucked under one armpit with a strap over the shoulder to hold it in place. There was an opening at the front from which the paper was extracted and strewn in handfuls over the path that the hares decided to take. The pack, or hounds, was led by a pace who wore a distinctive sash and who had to be give three yards clearance from the pack; the whip, or whipper-in, was at the back of the pack and communicated with the whip informing him to slow down if one of the pack was struggling, or speed up if the pack was finding the pace too easy. There was a club five mile run on 15th January and it was a simple pack run from the Two Mile House. That first winter was fairly typical of a cross-country season in the 1890’s/early 1900’s. There was no Bellahouston Harriers team in theNational Cross-Country championship on the first Saturday in March because most clubs did not enter teams – only four clubs (Clydesdale, Edinburgh Harriers, West of Scotland and Edinburgh Northern) had entered and in 1895 only two teams competed. There were three major races – the Clydesdale Individual and Team Race, The SCCU Junior Championship (later to become the Western District Championships) and the National. The remainder of the winter was taken up by inter-club (or joint) runs, club runs and club championships. Newspaper coverage was variable. The big races were covered and included the English championships, but otherwise it was down to the clubs to submit a short report on their Saturday runs. These ran up to a maximum of about four paragraphs and were printed in a single column under the heading ‘HARRIERS’. Not all clubs used this facility but most submitted reports with a segree of frequency. The regulars in the Glasgow Herald were Edinburgh Harriers, Clydesdale Harriers Greenock Section, Clydesdale Harriers Dumbartonshire Section, Clydesdale Harriers Juniors, Dennistoun Harriers, Paisley Harriers Senior, Paisley Harriers Junior, Whiteinch Harriers and so on. Bellahouston was a fairly frequent poster in this column. In winter 1893/94 the pattern was much the same except, as you might expect, that there was more interaction with established clubs. The reports up to the end of 1893 had the following on the club fixture list. Only some will be quoted. October 7th Bellahouston Harriers had their run from Queen’s Park Cafe, Crosshill. Pack of 20 over five miles. October 16th Joint run with Whiteinch from Half Way House – about 60 members turning out. 4 November, 1893, 30 members in a run from the ‘mustering place’ of Harvey’s Half Way House over about 5 miles. 25th November: “MARYHILL HARRIERS: The club had a regular field day at Maryhill, where they had for their guests the Edinburgh Northern (holders of the national junior championship), Western, Queen’s Park, Bellahouston and the Coatbridge section of the Clydesdale Harriers clubs. The rendezvous was the Old School Room, Maryhill, where accommodation was taxed to the utmost to provide stripping room for the large attendance.” Four packs were run with the hares setting out at 3:30 for a trail round the banks of the Kelvin, Acre Road and ending up along Canniesburn Road. 9th December: Joint run with Cairns Harriers from the Gardener’s Hall, Cambuslang. 23rd December: A home run from the Half Way House and two packs ran over seven miles. 30th December: No run was noted but there was a large joint run organised by Queen’s Park and the club may have been represented in that. 6th January, 1894: About 20 members took part in the run which, owing to the snow on the ground and the lack of coloured paper to lay the trail, was done as a single pack along the road to Paisley and back. 13th January: A record attendance covered a trail of about ten miles in two packs. 17th February: The Western District Cross-Country Championships. Scottish athletics was notionally divided into two groups – the senior clubs (the oldest clubs such as Clydesdale, West of Scotland, Edinburgh Harriers, Edinburgh Northern, Motherwell YMCA) and the Junior clubs (the rest who were not thought to be of a high enough standard to contest the national championship. The Western District had just been formed and set up these championships for the junior clubs. In this, the first event, Bellahouston Harriers were the winning team. Ten clubs ran over a trail of seven miles and Bellahouston’s first runner was EG Biggar in fourth place. The other runners were W McGuigan sixth, J Anderson ninth, W Sorbie tenth, JR McDermid twelfth, J Paton. These are the actual places as the runners crossed the line, for team scoring places those contestants who did not have a team were discarded and so the actual scoring positions were lower. Nevertheless, the club probably was not too concerned about that since at the age of only two years they had won a championship! 24th February: only 14 runners turned out for a run over a six mile trail. This brought us back to the national championship at the start of March in which only 4 clubs took part. It had been a good winter for Bellahouston Harriers with the best performance being the victory in the new Western District race with some good packing – five of their six being between fourth and twelfth. The pattern had been as before with more joint runs being included, numbers seemed to be growing and the very young club was gaining in confidence and experience. The continuing habit of having only four or five teams running in the National Championship continued with no signs of it becoming really open in the near future. The really big successes for the club over the next few years were individual however rather than team and we can look at some of them now. The most notable of them all was probably John McGough. There is a proper full-length profile of him available if you click the link buit he was the country’s most outstanding middle distance runner of the period. McGough won the SAAA Mile title in six consecutive years from 1902- 1907, he won the half mile three times and the Four Miles once. In 1903 he actually won all three in the same championships. He represented Scotland in many internationals on the track and ran in the London Olympics in 1905. The club history claims JV Paterson, Scottish cross-country champion in 1898, ’99 and 1900 as a club member – and he undoubtedly was for several years – but the records (official history, newspaper reports) list his club as Watsonians when he won the three titles. Check the link. Over the country, several club men represented Scotland in the period up to the war – PC Russell 1905, ’06, JW Templeman 1910, ’11, ’13 and ’14, GR Stevens 1912, ’14, G Cummings 1914, J Lindsay 1914. JW Templeman was the most prolific. In 1910 there was no Bellahouston Harriers team in the West District championships and there were no runners placed in the first 20 but when the National came along on 5th March Templeman was fifth. The first six placers were : A McPhee (Clydesdale), J Duffy (Edinburgh), T Jack (Edinburgh Southern), G Templeman (BH) & George McKanzie (West of Scotland and A Mann (Clydesdale). The international was to be in Belfast on 26th March and Templeman was fifth Scot to finish for the team that was third. Other Scots were McPhee 8th, Duffy 15th, MacKenzie 16th, Cuthbert 19th, Templeman 20th. Wallach, the top Scot, dropped out. For all his ability, Templeman did not contest the WEest District Championships on 4th February, 1911, at Carntyne Racecourse where the club finished third with the scoring runners being A Craig 3rd, JY McAdam 16th, G Stephen 17th, E Rodger 18th, D Honeyman 51st and W Law 77th. Unfortunately there was no Bellahouston team in the National at Sheep Farm Park, Pollokshaws but Templeman was third to finish nd was selected for the international at Newport later in the month. It was a pity that there was no team from the club on what was pretty well a home trail but the practices of the time prevailed. This time though, Templeman failed to finish on a day that was dry underfoot but with some slight snow falling. As a result three Bellahouston Harriers were picked for the international at Juvisy Aerodrome, just outside Paris. All three Bellahouston men were scoring runners for the Scottish team. A Kerr 11th, A Craig 14th and Templeman 18th. The team was third. There were so many firsts for Bellahouston at that point – first club man to win the national, first club team to win the national, first time they had three in the international and all three were counting runners! There had been three Bellahouston runners in the international team in 1913 and again in 1914 but the first to gain the honour did so eight years earlier. 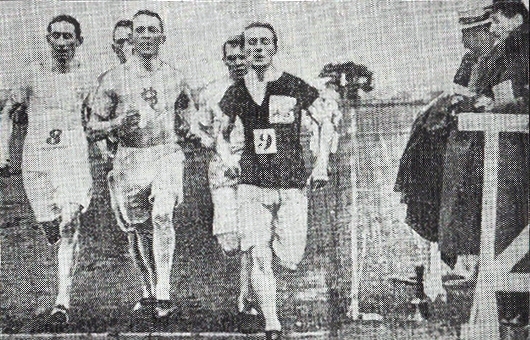 PC Russell however had run for Scotland when he finished second, and first Junior, in the National of 1905. The team was sixth. A month later, in the international at Baldoyle in Dublin, he finished 14th and was a scoring runner for the Scottish team which finished second. Three medals, two gold and one silver, for two races was not a bad end to the season. The following year Russell finished fourth in the National and was picked to run for Scotland at Caerleon in Wales where Scotland slipped back to third position with Russell again a scoring running when he finished in 15th. The club continued to progress and, in addition to the many top class club team performances,, several very good athletes were produced to grace Scottish athletics. 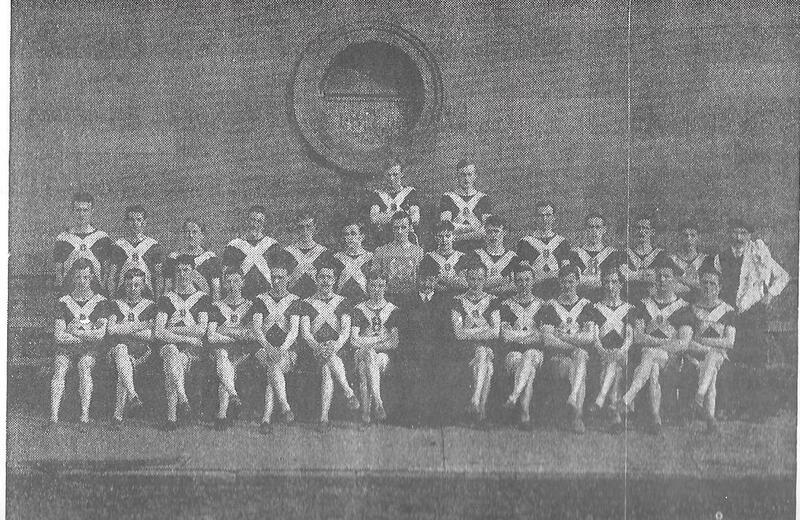 In 1920 at the first national championhip after the war, Bellahouston was third team. This series of articles is headed “In the beginning…” and the intention is to look at the various ways in which clubs sppeared and developed into serious players on the national stage. In this context, the origins of Bellahouston Harriers mirror the development of Scottish athletics from the nineteenth century to the start of the first war. In 1892 there were very few races on the calendar, many more were in evidence by 1914. There were no international fixtures, either track and field or cross-country in 1892 but there were annual internationals in both discilines by 1914. Inter-clubs, joint runs and muster runs were still present in 1914 but not in such big numbers. Thgere were also changes in training methods and running clothing over the period. There is a profile of the road and cross-country activities of the club in the 1945 to 1960 period at this link. ‘From Long Shorts to Short Longs’ by Robin Sykes. 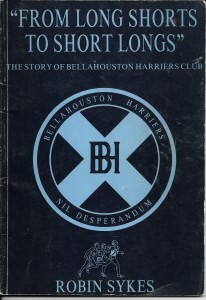 The official centenary of Bellahouston Harriers from which several illustrations have been taken. 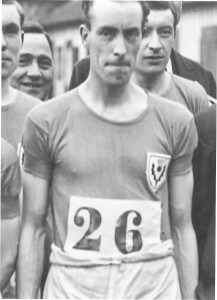 Robin Sykes (pictured above) took up the sport inthe late 40’s and has been a great club servant winning over 2000 pts in inter-clubs, finalist and medal winner in championships at Scottish and British level, set a Scottish record for the decathlon of 6330 points in 1960. 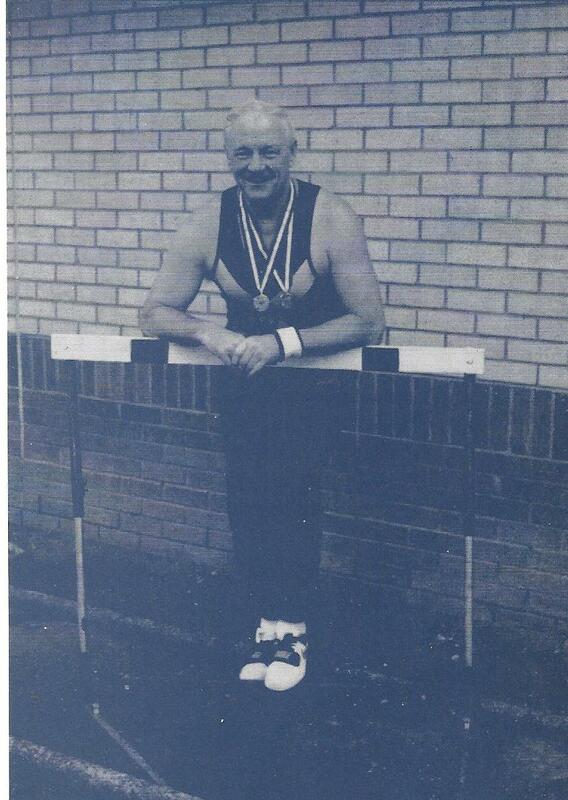 Now 82 years old, he still competres in the Scottish Veterans Field Events Championship. 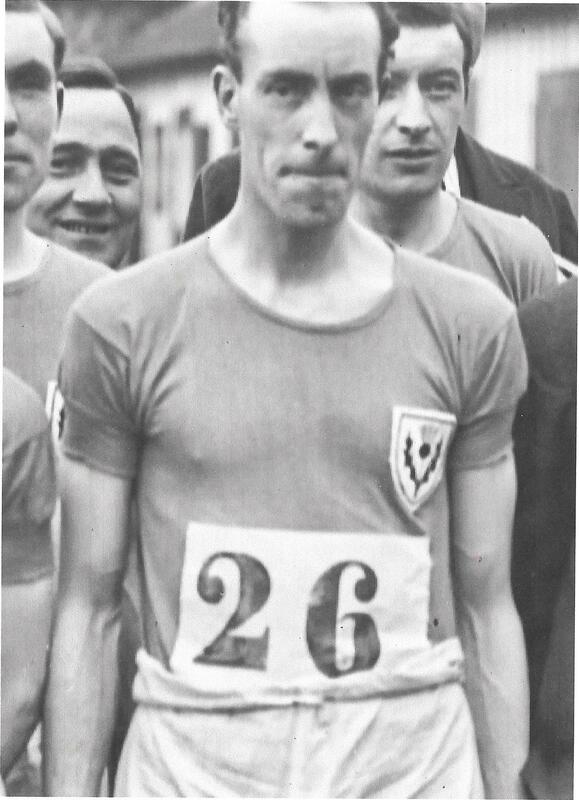 ‘A Short History of Bellahouston Harriers, 1892 – 1946’ in ‘The Scots Athlete’ number three by WR McNeillie. He joined the club in 1922 and filled many roles in the administration, notably as Secretary and Treasurer. He also served as an official at many meetings and for a time was one of the handicappers at open meetings. ‘Whatever the Weather’ by Colin Shields. This is the official centenary history of the SCCU written by a man who was a runner, an official, an administrator, a historian and reporter to both specialist athletics publications and to the press. Colin was also President of both SAAA and SCCU. ’50 Years of Athletics’ ed. K Whitton and DA Jamieson. The 50th anniversary history of the SAAA published by the SAAA in 1933. The Glasgow Herald archives for the period.